Global Cross began working in Honduras in 2014. We started by polling local pastors and discovered a growing need for solid Biblical training and Christian resources. 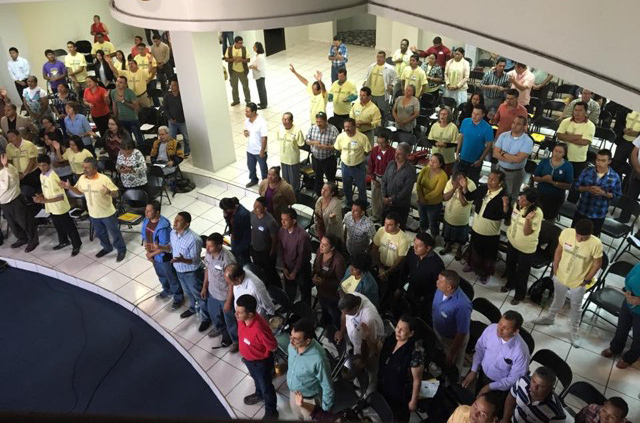 This led Global Cross to partner with Reed Skinner and For His Kingdom Missions to host a three-day apologetics conference for over 200 Honduran pastors last month in Tegucigalpa. So many people contributed resources which were distributed to the pastors. Global Cross donated Parchment tablets and cards loaded with Christian resources in Spanish. Individual donors and organizations provided Spanish Apologetics Bibles. Reasons for Hope donated Spanish versions of Who Made God? And Answers to Over 100 Other Tough Questions of Faith by Zacharias & Geisler. These resources were welcomed and an answer to their prayer. The pastors were seeking solid theological and apologetics training and showed it in their enthusiasm during the event. Joel Grout from the Institute for Christian Research also participated and provided training during the conference. We would like to thank all those who contributed in various ways. This was a huge team effort filled with prayer and worship. We look forward to what God has in store next in Honduras.